JPMorgan kicked off the 2019 earnings season with a big bang beating mightily on the top and bottom lines. The results show that America's best bank continues to impress and sees no recession in the near term. The much better than expected results have sufficient potential to carry the market and the stock to new highs. As markets were hovering near their all-time highs, JPMorgan Chase (JPM) kicked off the 2019 earnings season with a big bang. A whopping $0.30 beat on EPS and a similarly impressive $1.5B revenue beat stunned investors. 10 years after the financial crisis, the bank is truly back in big, big business with all divisions performing strongly. Best-in-class management and sublime performance make this stock a great long-term buy. What is going on at JPMorgan Chase? JPMorgan easily beat on the bottom and top line with its Q1 figures generating $2.65 in EPS and revenue of $29.85B. On a forward basis, this translates into a P/E ratio of below 11. The bank's four major divisions showed strong performance with the investment banking branch rebounding strongly from its lackluster Q4 performance and Consumer and Community Banking climbing towards new highs. Interestingly, although the bank recorded record earnings of $2.65 individual net income by division did not set a new record. Consumer and Community banking raked in $3.96B and is just shy of the $4.03B set in the preceding quarter but up a massive 19% Y/Y. The biggest contributor to record EPS was surely the strong comeback of JPM's investment banking generating net income of $3.25B which presents a 64% sequential improvement but still fell notably short of the year-ago figure of $3.97B. In the first quarter of 2019, we had record revenue and net income, strong performance across each of our major businesses and a more constructive environment. Even amid some global geopolitical uncertainty, the U.S. economy continues to grow, employment and wages are going up, inflation is moderate, financial markets are healthy and consumer and business confidence remains strong. Although the earnings season has just started, JPM's return on equity of 16% will be very tough to beat by any of its competitors. It is up 4pp Y/Y and 1pp on a sequential basis. 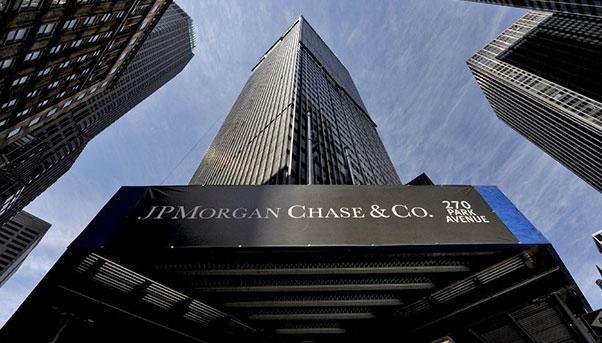 JPMorgan's closest competitors, Bank of America (BAC) - 10% RoE in Q4, Citigroup (C) - 9.9%, Goldman Sachs (GS) - 13.8% and Morgan Stanley (MS) - 10.4% in Q4, were all lagging behind JPM's return on equity in Q4/2018 and likely will do similarly in Q1 with Goldman Sachs being the closest on its heels. Other impressive figures of JPMorgan's Q1 include a healthy 10% growth in credit card sales volumes driving the strong performance in Consumer and Community Banking whereas 4% growth in the retail loan portfolio and 3% in deposits provide a wide and steadily growing basis. On top of that the bank has been returning huge amounts to shareholders. It repurchased stock worth $5.1B in Q1 for an aggregate purchase price of $102.78. Thanks to the strong post-earnings rally that has lifted the stock to $111 that was a wise decision and given this quarter's strong performance, I am expecting new all-time highs for the stock throughout Q2. What's in it for dividend investors? A bank is not necessarily the first stock that comes to an investor's mind when looking for income - and certainly not an investment bank. While Canadian banks have shown for more than a century that banking per se is one of the most stable and reliable businesses to be engaged in, the dividend track record of U.S. banks is anything but close. JPMorgan, for instance, initiated its dividend in 1996 but had to slash it to almost $0 when the 2009 financial crisis erupted. However, since then, the dividend has been increased by factor 16. Canadian banks like the Toronto-Dominion Bank (TD) have a dividend history which is characterized by at least stable but mostly growing dividends. 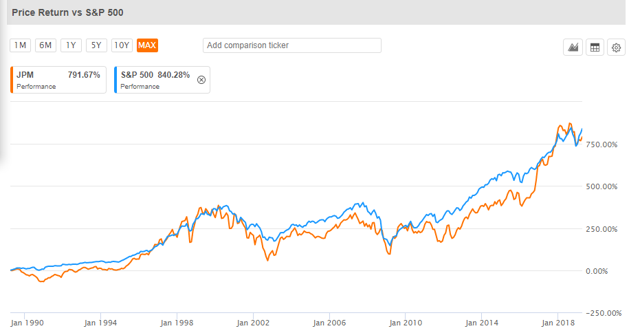 And even when one of the worst financial crisis hit the market, TD was able to hold its dividend steady. JPMorgan has been hiking its dividend very aggressively. From a low of $0.05 10 years ago, the quarterly dividend has jumped to $0.80 and was raised by an eye-popping 42.9% in October 2018. Based on the stellar Q1 performance, this translates to an EPS payout ratio of 30% which leaves tremendous room for further dividend increases and substantial leeway in case the economy does eventually turn south. The big banks are currently lagging the S&P 500 on a YTD basis but if JPM's peers show similarly strong numbers, they could quickly outperform the broad markets given that their valuation is still comparatively low. Over the long term, JPM has been matching the broad market quite nicely but with much faster dividend growth regardless of any short-term hiccups. Due to the recent rally, the dividend yield has now dipped below 3% but in reality, the stock easily trades at a forward yield above 3% assuming that JPM will raise the dividend by at least 5% which is as certain as it gets. Following JPMorgan's very strong Q1 results, any talk or concern regarding an imminent recession is overblown. The bank sees no indication of an imminent recession and even stated that "there is no law that says it has to stop." On the contrary, CEO Jamie Dimon even highlighted 11 problems which are currently holding back the U.S. economy suggesting that it could do a lot better. He stated that instead of growing 20% over the last decade it should have grown 40% under normal conditions. There is no quick fix to any of these issues but the good thing is that given that there is still plenty of opportunity for further growth if it is harvested in a proper manner, this also implies that the stock markets have ample upside potential. America's most profitable bank has shown that it can prosper when the economy is doing well and should perform even better if the economy realizes its full potential. Meanwhile, long-term investors can benefit from double-digit dividend growth and a healthy 3% forward yield for a stock supported by strong buybacks with the momentum clearly on its side. If you enjoyed this article, the only favor I ask for is to click the "Follow" button next to my name at the top of this article. This allows me to develop my readership so that I can offer my opinion and experiences to interested readers who may not have received them otherwise. Happy investing. Disclosure: I am/we are long JPM, BAC, MS, TD. I wrote this article myself, and it expresses my own opinions. I am not receiving compensation for it (other than from Seeking Alpha). I have no business relationship with any company whose stock is mentioned in this article. Additional disclosure: I am not offering financial advice but only my personal opinion. Investors may take further aspects and their own due diligence into consideration before making a decision.